This year was the 50th anniversary of the Washington Square Music Festival. Outdoor music festivals are one of the great summer pleasures and we are privileged in New York City to have such stable of talented musicians who are willing to participate. 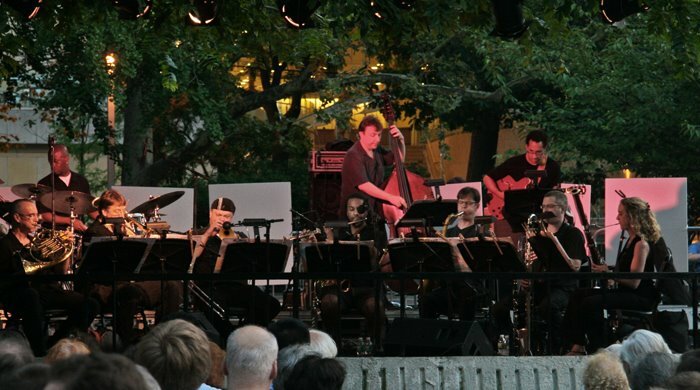 The annual concert series is free and typically takes place over four Tuesday evenings in July. This year's was five concerts culminating in last night's concert with a jazz program - the Charles Mingus Orchestra playing the jazz of Charles Mingus. Seating is provided on a first come basis, but the music can be easily enjoyed standing or sitting in nearby benches. The atmosphere is informal.